Dear Mona, How Many People Have Never Drunk Alcohol? A bar at The Roosevelt Hotel in Los Angeles. Dear Mona, I am 24 years old and have never drunk alcohol. What percent of people in my cohort do not drink? Your probability of having experienced a hangover: zero. There’s an abundance of statistics on binge drinking and the costs of alcohol consumption, but looking at the people behind the zeros is more challenging. To understand abstention trends, we can’t do much better than the National Survey on Drug Use and Health. Its latest data is based on 68,309 interviews conducted across the United States in 2012. The survey asked Americans whether they had consumed various drugs in the past month, in the past year or in their lifetime. 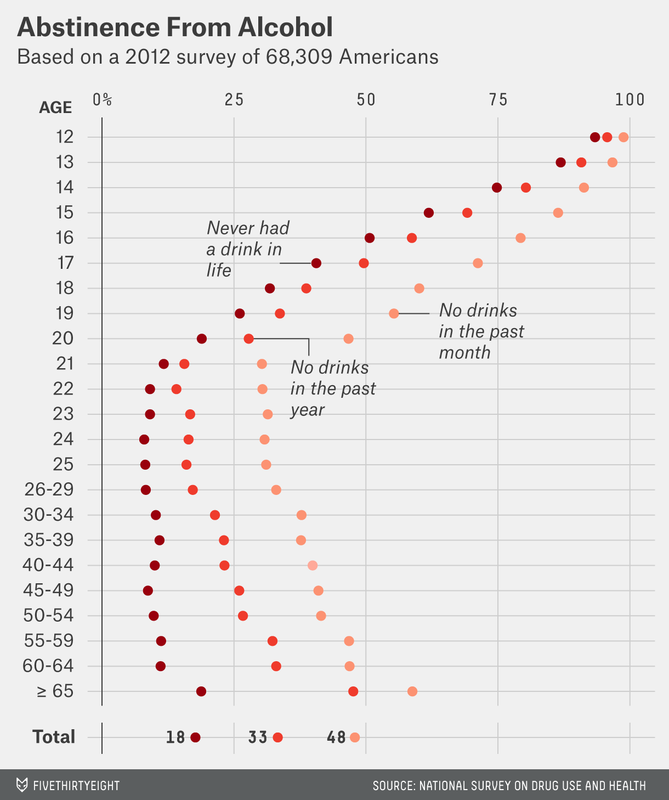 Among everyone 12 and older (it’s a strange age bracket, but it’s how the gender data comes), 14.9 percent of men said they had never drunk alcohol compared to 20.4 percent of women. The racial differences are even larger: For example, Asian-Americans are three times as likely to have never drunk alcohol as non-Hispanic whites. Alcohol abstinence rates don’t just vary by demographic traits; they vary by geography, too. In the Midwest, 15 percent of respondents said they had never drunk alcohol compared to 19.3 percent in the West. Residents of midlevel counties — those considered neither rural nor completely urbanized — were the least likely to have consumed alcohol. And when it says prevalent, it means prevalent: In 2010, 48 percent of the world’s population age 15 and older had never consumed alcohol (the gender difference exists globally, too; in every region the WHO looked at, women were more likely to be lifetime abstainers than men). Is religion an explanation for trends in the United States, too? When I replied to you and asked why you hadn’t drunk alcohol, you said it’s because you’re Mormon. The National Survey on Drug Use and Health doesn’t ask respondents why they consume or don’t consume certain drugs, so it’s difficult to know the exact role religion plays in national trends. But focusing on just lifetime rates (as opposed to past year or past month, when factors such as addiction, ill health or even “Drynuary” could affect the results), it’s probably safe to conclude that religion plays a big role for many who choose to abstain from alcohol. More important to your question, there are roughly 2.5 million Americans ages 20 to 24 who say they have never drunk alcohol. So, Tyler, you’re clearly not alone.